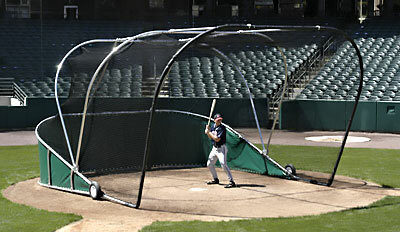 The Big Bubba style portable batting cage is the choice of high school, collegiate and professional baseball programs. 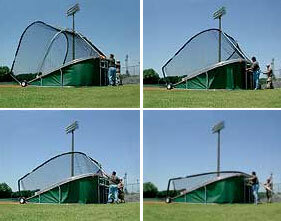 Includes batting cage, net, dark green vinyl skirt, and extra baffle net behind batter. Unit constructed of 2" heavy-wall aluminum tubing, heavy duty 3.5mm weather-treated EHT netting, and heavy vinyl-coated 18 oz. nylon skirt. 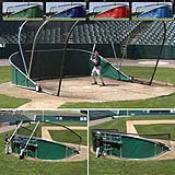 This heavy-duty construction, easy portability and collapsible design make it the perfect backstop for any level. Collapses to only 5' high to limit storage space requirements. Two 16" pneumatic side wheels and rear 16" pneumatic steering wheel make relocation simple. 42' of ricochet cushion minimizes ball rebound and reduces damage to frame. Use the coaches observation bar for safe elevated viewing. Dimensions: 18'W x 22'D x 12' H. Weight: 408 lbs. Nets are HEAVY DUTY weather-treated 3.5 mm EHT cage netting. Replacement net includes cage netting and baffle net behind batter. Skirts are Nylon reinforced, 18 oz. Net was difficult to get set. Many tries. The collets work loose on our old one. Tighten the set screws today and they are loose in a couple days w/o moving it. I used self tapping screws through collet and tubing. Will see how it works. Nets- difficult with their directions.